Ring Type Variable Spline Indicators are used to check effective & actual tooth thickness on an external splined component. These Spline indicators are typically supplied with digital Mitutoyo indicators which display a readout of the tooth thickness. 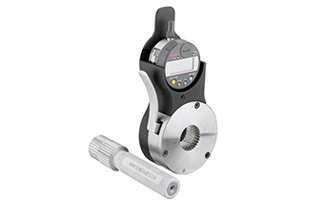 Functional Go and NoGo Ring Gauges are perfectly adequate for some manufacturers as they confirm if a component is within or outside the required tolerance band however for some manufacturers it is necessary to actually measure and record the tooth thickness. Spline Gauges also have the capabilities to produce Straight or Helical Variable Spline Ring Type Indicators to suit customer requirements.